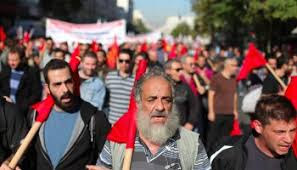 Greek news reporters have began a 48-hour strike today, demanding better working conditions. Greece was without TV and radio news today and there will also be none, tomorrow, Wednesday. It is the second time reporters have gone on strike in October and the fourth in two months. The previous strike lasted 24 hours. The state news agency ANA-MPA and printed media employees also joined the strike action, so there would be no newspapers on Wednesday and Thursday. “The journalists’ union wants its depleted health insurance fund rescued, better wages and an end to practices that leave reporters with little choice but to take lower-paying part-time jobs,’’ it stressed. Greek reporters have been facing hard times during the past eight years of crisis and austerity. Several newspapers folded and several cut their staff, so many journalists are out of work.